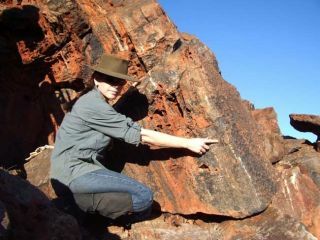 Abigail Allwood of Macquarie University points to the fossil reef she discovered in the Pilbara. The Internet puts the world at our fingertips. As the speed and capacity of the pipeline grows, new projects are blending the Internet, basic scientific research, video production, and global geographical data, A few keystrokes take us to locations everywhere on Earth and beyond. As virtual explorers, we can visit locales most of us are unlikely to ever trod in person. Astrobiologists explore extreme environments on Earth to understand life. They seek to understand the origin and evolution of life here in order to develop tools and strategies for seeking life on Mars, Europa, and beyond. "Let's take a walkabout, mate," an Australian would say at the beginning of an outback adventure. Now you can do this from the comfort of home. Join scientists in Australia via the "Virtual Field Trip" (VFT) at NASA's Quest website. The VFT is an immersive multimedia application developed to support student and user exploration of areas on Earth that have been identified as analog sites to regions on Mars. In their first education and public outreach collaboration, NASA and Macquarie University in Sydney, the Australian Centre for Astrobiology, have created an innovative online field experience that combines the cool tools of the Internet with good scientific fieldwork at remote sites. You can walk about via panorama tools and zoom in on interesting places in the Pilbara and Shark Bay. Short interviews can be tapped to learn more about the geology, fossils, and living organisms. The VFT brings scientific fieldwork into your home or classroom. It's fun and interesting. And, it debunks the myth that science is something that happens only in air-conditioned labs. A complementary film, "Looking for Life: Exploring Earth's Analog Environments for Alien Life" premiered last week. Travel with astrobiologists to four field sites: the Pilbara in Australia, the Rio Tinto in Spain, a deep gold mine in Nunavut, Canada, and to the top of Licancabur Volcano in South America. (Check NASA television and your local PBS station for broadcast dates.) Scientists and students lead the expeditions to these sites, seeking samples and observations. SETI Institute's Adrian Brown (formerly of Macquarie University) examines stromatolites at Shark Bay in Western Australia, and Mars researcher, Nathalie Cabrol, dives in one of the world's high lakes in Bolivia. These extreme environment field sites help us to understand the origin and evolution of life on Earth, and how life might survive and evolve in the extreme environments on other worlds like Mars. And, these scientists are not your stereotypical guys and gals in white lab coats that many students envision when they think "scientist". They are explorers. They work in challenging environments that require high technology, keen observational skills, and travel to very interesting places. If you yearn to travel this summer, and find that the price of fuel and airline tickets is slowing you up, "take a walkabout in the outback" with your computer. It's free, and you'll find trekking with these scientists a unique experience. VIDEO: Excerpt from "Looking for Life"